Get free advice and estimates from fence contractors in your city. ​Fences are an important and integral part of many properties. They offer privacy, security, and safety for pets and children. They can also help enhance curb appeal and landscaping at the same time. There are many different types of fence materials used today, and wood and vinyl are two of the more popular and common choices. Below, we’ll outline the differences between them so that you can make a more informed decision for your home. When it comes to style, most people know what to expect from a wood fence. They have been in use for centuries, and whether the style is traditional or contemporary, there is little in the way of surprises. Wood fences can be painted in many colors or stained to match your property, and there are also a number of decorations available to enhance your fence, including corbels and caps. Vinyl 1 fences are newer but are gaining in popularity since they don’t require painting or maintenance, don’t chip or fade in the sun, and are resistant to termites. There are fewer color options and styles available, but there are enough choices available on the market today to let you find one that matches your property. Both wood and vinyl fences should ideally be installed by a professional. Both entail digging holes for the posts, and in most cases include pouring a setting material to hold the posts in place while the fencing is strung between them, making the installation a two-part process. Vinyl fences are marginally easier to install, and in some cases are sold in kits, which can be put up by a DIY homeowner. 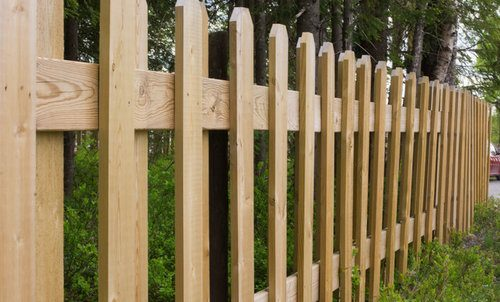 This is because while wood fencing often requires on-site cutting, fitting, and nailing, vinyl fences often lock together with invisible screws, making few tools necessary. 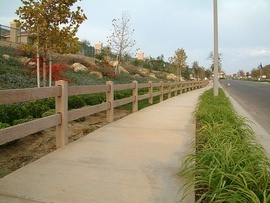 In most cases, the cost of installation is included in the total quote for the fence. However, for some more difficult installations, it may be quoted separately with costs starting around $25 to $50 per hour for wood fences and $40 to $60 per hour for vinyl fences. Both wood and vinyl have a range of options for style, which in turn can affect your overall cost for both material and installation. Pressure-treated pine is the most commonly used material for fencing, but it doesn’t last as long as some other, more durable woods. For this reason, many people opt to have their fence made from cedar, tropical hardwoods 2, or black locust 3. Costs for wood fences start around $3 to $6 per linear foot for a split rail fence 4 made of pine and increase to $9 to $18 a linear foot for a privacy fence 5 made of tropical hardwoods 2. This usually includes the cost of installation, but a difficult install may increase the costs by $25 to $50 an hour. So a typical 6-foot privacy fence will cost around $6,500 to $10,000 for 209 yards of fencing. Vinyl fences have a similar range of costs, mostly due to the style of the fence rather than the material. Vinyl does cost more than wood at the outset, but it lasts longer and requires no maintenance, which may offset the higher costs in the long run. Prices for vinyl fencing typically run around $20 to $35 a linear foot, with installation running around $40 to $60 an hour if needed. A 6-foot privacy fence 5 will therefore cost around $14,000 to $20,000 for 209 yards of fencing. 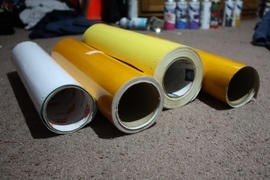 Of the two materials, vinyl is the most durable and has the least amount of regular maintenance. Wood fences require regular staining or sealing to help protect them from the elements. This stain or paint may peel, requiring scraping and refinishing every few years. In addition, wood eventually rots and warps, particularly in humid or wet areas. Wood fences may also be subject to rusting nails pulling free, sagging, or losing shape over time. They are also susceptible to termites and other insect activity. The species of wood used can affect how quickly this happens. Pine will require more maintenance, while woods like cedar and tropical hardwoods are more resistant to humidity, pests, and fungus, which means they will last longer. Vinyl fences are made of a type of plastic, so they aren’t subject to rotting, peeling, or decaying. They don’t change color over time the way a wood fence will, and the only maintenance is the occasional cleaning that may be needed to free the fence of built-up dirt. 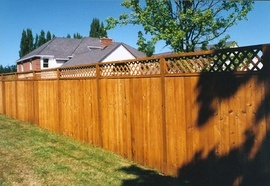 Therefore, a vinyl fence may last for decades longer than a wood fence, without yearly upkeep. Both types of fences may need occasional repairs over their lifetime. Wood fences that warp or sag may need to have boards replaced to help the fence maintain its integrity. In addition, wood fences may break or snap under pressure, such as high snow drifts or contact from a vehicle. Vinyl fences may also come apart with enough pressure. A snow plow pushing a load of snow against a vinyl fence may cause the rails to pop free. However, vinyl fences go back together fairly easily and can be repaired by most homeowners within minutes, while wood fences may need professional repairs to help make them look new again. When harvested properly, wood fences can be sustainable and eco-friendly. 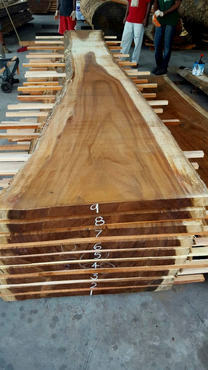 Softwoods and modified softwoods are the most sustainable. Untreated softwoods don’t last as long as hardwoods, however, which may mean you need to replace the fence more frequently. A modified softwood fence is a good choice for sustainability, as they can last decades without maintenance, and the trees regrow quickly. Tropical hardwoods make nice choices for fences from a durability standpoint, but many tropical hardwoods are becoming endangered due to improper harvesting, and the fact that hardwoods take an average of 70 years to regrow. Vinyl fences last longer than wood fences, which means you will need to replace them less frequently. However, when the time comes to replace your fence, it may be difficult to find a recycling center that will take vinyl. Some vinyl fences may be made of recycled content, which can help increase their sustainability. Regardless of which type of fence you choose, ask the manufacturer about their manufacturing processes to learn more about the sustainability of that particular product. 3 Black locust: A type of wood that is commonly used for fences. It can also be used for furniture, flooring, decking, and other applications. It is hard, heavy, and very durable. How much does it cost to install a wood or a vinyl fence in my city? Cost to install a wood or a vinyl fence varies greatly by region (and even by zip code). To get free estimates from local contractors, please indicate yours. Cost Considerations: Ranch-style fences are generally the most economical type of fence, costing roughly $3 to $6 per linear foot.